I find this article “11 Reasons Your Crazy Cat Obsession Makes You Happier And Healthier” improves my understanding for the relationship between people and their cats. I quote a specific paragraph in the immediate following, then the entire article. I quote the entire article on my personal web page: http://www.rencircles.org/dogs/cats/11-reasons-your-crazy-cat.html. The article source is on this web page http://www.huffingtonpost.com/2015/03/15/how-cats-help-us_n_6809820.html. Iris Grace Halmshaw, the 5-year-old British girl in the photo above, was diagnosed with autism in 2011. 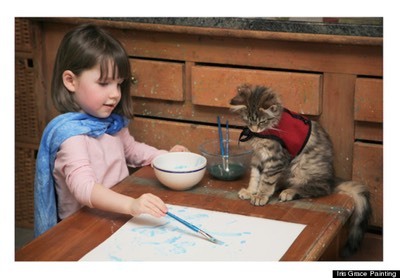 Her therapy cat Thula has helped her gain enough confidence to speak to others, as well as providing additional inspiration for her painting — another component of her therapy. They can help people with autism communicate. Children and adults who have autism sometimes struggle to communicate with the world around them. However, pet therapy has proven a helpful learning tool, as many people with autism feel a stronger connection to animals than they do other people. 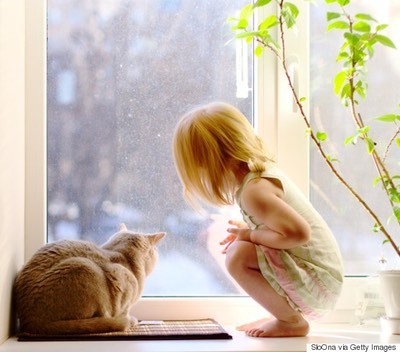 A 2012 French study observed 40 autistic children and their family pets and found that the children felt calmer and could socialize more easily than those without a pet. They associated this change with the increased production of the hormone oxytocin, which can be triggered by petting a cat and further increases feelings of trust and love.